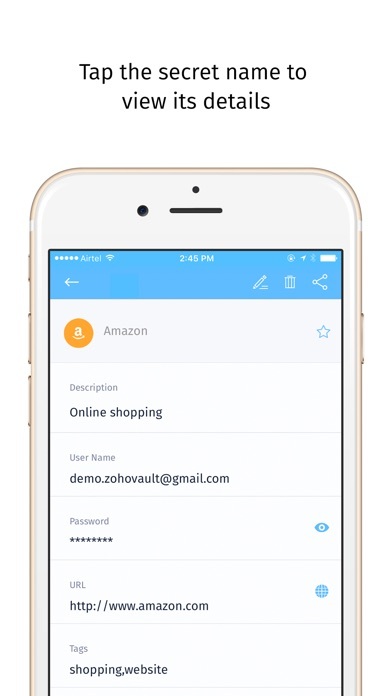 Zoho Vault is an online password manager that makes your digital life easier. If you are struggling with remembering numerous passwords, Zoho Vault can keep them safe for you. 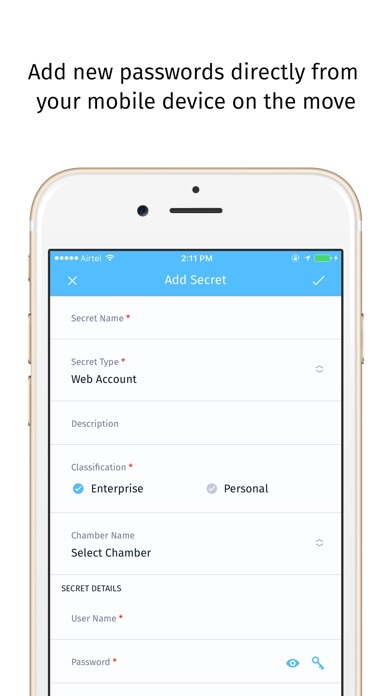 The securely designed vault acts as a centralized repository, where all your passwords and personal information are stored with complete privacy. It is also an absolute must for teams that need to share sensitive information securely among themselves. Smart Password Management ● Password vault - Securely store login information of web accounts, credit card and passport details, social security numbers, important files and more. ● Auto Logon - Log in to websites directly from Zoho Vault app without having to type your passwords. ● Flexible options - Add new login accounts and other items to Zoho Vault as you create them. Modify and delete information as needed. 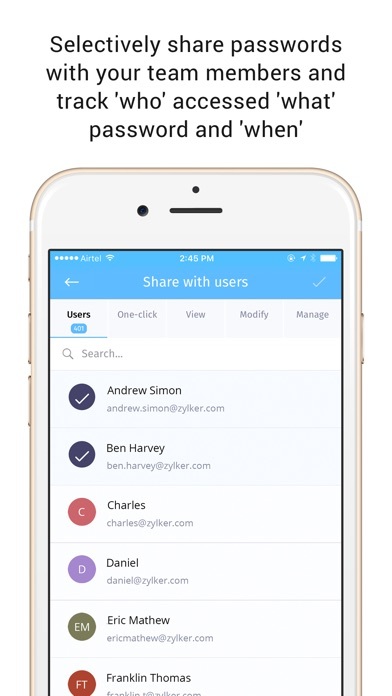 ● Chambers - Sort your passwords into chambers when you add them for an organized view. ● Quick search - Attach tags to different items and include important information as secure notes. ● Password generator - Produce strong, unique passwords for sites using a built-in password generator. ● Offline access - Back-up your information locally on the mobile device and switch to offline mode when there is no Internet connection. Unmatched security and privacy. 1. Zoho Vault protects your passwords with AES-256 encryption. Your data remains completely private. 2. The passphrase that you use to access Zoho Vault is the only key to your information and no one knows it except you, not even Zoho. 3. The app automatically logs you out in case of inactivity and locks itself. Simple, fast and convenient. 1. Sign up and get started in minutes. Create a Zoho Vault account with Google/Facebook/LinkedIn/Twitter profiles. 2. Work with a simple and straightforward interface that loads in seconds. 3. Auto-fill username and password on other apps in your device, by storing their credentials in Zoho Vault. 4. 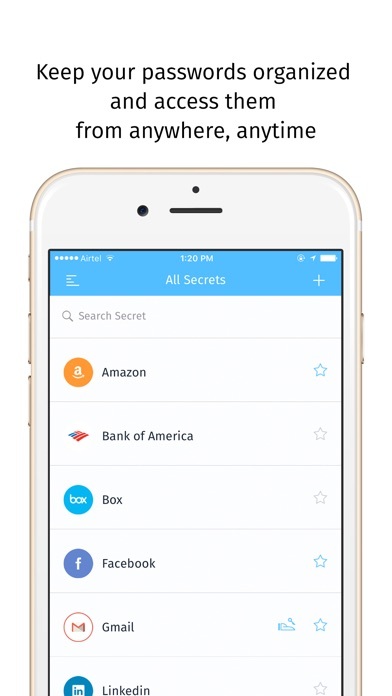 Create 'Favorites' and quickly access your frequently used data. 5. Sync your Zoho Vault account across your mobile devices and computers. Access from anywhere, at anytime. 6. Easily look up needed items with quick search options. Free forever for personal use; Affordable for businesses. 1. Subscribe to any of Zoho Vault's paid editions and unlock enterprise-grade features that appeal to businesses of all sizes and types. 2. Log in to Zoho Vault using your Active Directory credentials. 3. Approve access requests from your team and securely share passwords that you own in Zoho Vault. Have submitted a bug saying authentication with gmail throws an error and I got a response from the support team that it will be fixed soon. It’s been a month and so far no action. Appears to be stuck in some sort of a loop. It says "We have sent a login verification request to your mobile device" and to open oneauth application to scan your face. Tried logging into oneauth and I get the exact same notice. We provide lending consulting service to mortgage companies and credit unions all over the country. ZoHo Vault makes it easy for everyone working remotely to have all our account login credentials no matter where we are. Better security with remote accessibility and saves us time. Great solution for our team. No need to say more. Had wished this update would fix the problem. I’m using this app for couple years already Works well. Had problems with app crashing after an upgrade, but I’ve got help from the support team immediately. Keep it safe! Can not login without the app crashing. Please fix ASAP! Works well - can be set up to unlock with TouchID if you want. You can pull down in the list of all secrets to get to the search function, which is nice. This app pairs well with Zoho Vault for teams, which is great deal ($0.90/user/mo) when compared with other password managers for small businesses. I spent 9 hours setting up this program only to find out this is a password management program for PAID Zoho users only. If you share a password outside your group (paid Zoho users) then the program GIVES them your password!! I have now been on th euphonium with Apple for over an hour. No one can figure out how to get the software off my computer. Not even a top level advisor!